How did I start A Perfect Shine? A question I am often asked is how and why did I start A Perfect Shine Cleaning. Well that is a rather long story. For purposes of brevity I will give you the short version. I graduated from Chico State in the Spring of 1992. There I was with my shiny new Business degree and a beat up Kharman Ghia I had been restoring for the majority of my senior year in college. I hopped in the primer gray Ghia and headed south. The car putt putted towards San Diego. I had to get on the shoulder when I hit the grapevine and I barely managed to climb over the pass. When I got home to San Diego I soon began to realize what a recession meant to a boy ready to conquer the world. It meant I had hit a brick wall! So that is when you decided to start A Perfect Shine right? No, not quite yet. Instead I got a job working for the Department of Social Services. Not quite working my way up the corporate ladder but hey I was helping people out and it felt good to be able to work in that capacity. My first big boy job. The great part was that I had a 4-10 shift. I would work four days a week for 10 hours which allowed me to have 3 day weekends. By this time I had moved my way up the VW family and now owned a VW Camper Van. My 3 day weekends soon became 3 day trips further and furter south exploring Mexico and surfing and camping solo. I loved the freedom and always regretted the journey back North. Looking West in the VW. I was definitely missing something. I was being called to new journies and adventures. I needed a change. So that's when I decided to start A Perfect Shine right? No... not yet. Instead I decided to join the Peace Corps. Yes, that's right the Peace Corps. My trips further and further into Mexico apparently had only been a precursor to my next journey. I remember waiting in anticipation for the mailman to come to the mailbox each day. Finally the day came and I could barely breathe. When I opened the envelope from the Peace Corps I was filled with great anticipation and a minor dose of dread. "Congratulations you have been selected to serve 2 years in Nicaragua." My first thought was, "Where in the hell is Nicaragua?" My first choice had been some remote Carribean or South Pacific Island. I pulled out the map and saw the Pacific ocean to one side and the Carribean on the other. O.K. I can deal with that for sure. When my group of 13 volunteers met in Miami for a 2 day orientation before we left for Nicaragua, I remember one specific meeting. The trainer told us to look around at our fellow Peace Corps volunteers and then proceeded to tell us that out of the 13 volunteers, the statistics were, that 3 of us would return early and another 3 would marry local people. I looked around and laughed knowing I would never fall into either of those categories. Well 3 people from our group did return early and 5 people from our group actually did end up marrying locals. Including yours truly. Peace Corps was a blast and a life altering experience. That is another long story. My buddies and I biked and camped along the Pacific. Me spying a good campsite..
2 years later, I ended up marrying a local school teacher that managed to tug at my heartstrings and I couldn't envision living without her. So we married and headed back to the states. So that's when we started A Perfect Shine right? No... not yet. Actually I got a job working for a large mortgage company and climbed onto the first rung of that corporate ladder I had been searching for. Readjusting to the U.S. was a major challenge. My brain had a hard time wrapping around the 9-5 grind. Meanwhile my wife had been pestering me that she wanted to work. I told her to learn English and not worry about work. Well, try telling an independent Latina girl what to do. One day she came home with a job cleaning houses for a referral agency. Basically they found the jobs and she paid them 40% of the take. She did all the work, she drove her own car, she paid all her own taxes, etc... It didn't seem like a fair deal but I was deeply involved in my new little corporate gig. Slowly being buried under a mound of stress and pressure. This was during the leadup to the mortgage debacle and we were making loans to basically anybody with a pulse and I knew the whole thing was a house of cards. Every loan I tried to decline I was overruled by a V.P. trying to make his quota for the month. I was struggling and I knew I needed a change. We struggled along for two years and eventually I knew I had to make a break. No, I didn't start A Perfect Shine then. No, I bought a cabover camper, a trailer and I hooked it all up to my beefy F250 and headed south again. Yes, I had about $13,000 saved up and we decided to move back to Nicaragua and live forever! A little Hurricane called Mitch had different plans for me. Hurricane Mitch came with a vengeance and began pummeling me and my truck down in southern Mexico. It took on epic proportions when we crawled our way to the border of Guatemala. I am talking rain coming down so hard you literally could not see more than 5 feet out the windshield. I spent a lot of time in the mud and pouring rain under the trailer trying to fix the suspension. Not the great surf/fish adventure I had envisioned! We eventually made it to Honduras where the road literally came to an end. Hurricane Mitch had wiped out the highway systems and bridges in Honduras and Nicaragua. We ended up leaving our truck and all our worldly possessions with a complete stranger (an angel) and we hitchhiked and boated our way to Nicaragua. Central Americans are resilient and industrious. A guy would turn his truck into a taxi for the 2 kilometer stretch of freeway that was left, you would then hike for a couple miles until another stretch of road was available and another makeshift taxi would be there. A makeshift ladder where a bridge used to be and a guy at the bottom ferrying people over the river for a dollar. This is what we did for about a week until we arrived at our town and my wife's family home. We were greeted with no running water or electricity for 2 months. Not a great reception and very little opportunity to start a new business in a country struggling to rebuild its infrastructure. We decided instead to build a house and that is where we put our energies for the next 6 months. As the house neared completion, my wife came to me one day and said she wanted to go back to the U.S. WTF? No way! Now life had definitely not gone our way but going back did not seem like a good option. I thought long and hard over copious amounts of rum and cokes and when I finally made my analysis of our dwindling finances and future business prospects in a struggling country I finally agreed with my wife and came to the conclusion that I would return to the States with one caveat. I would never again work in an office or corporate setting and wear a suit and tie. No monkey suits! My wife agreed and once again we headed north.. .this time by bus! Caribbean Coast. Good place to sit and think! When we arrived in the states I had the great idea of becoming a bartender and I enrolled in bartending school. 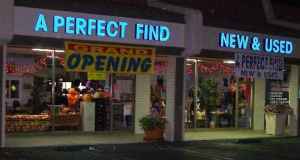 Meanwhile, my wife had gone back to working for the referral agency. I was still searching for purpose and meaning in my life and trying to decide where I fit into the grand scheme of things. The bartending gig never panned out. I decided I could at least help my wife get some jobs on her own and not have to pay the 40% to the referral agency. YES... that is when I decided to start A Perfect Shine Cleaning. It was all a great gamble. My wife quit the Referral Agency and we were now at the mercy of our new business. We worked our butts off. We worked from 7 a.m to basically 10 PM Monday through Sunday. We would never turn a job down. It was just my wife and myself and we cleaned 5-6 houses a day. Fortunately my mom had been a cleaning fanatic and taught me how to properly clean a house from top to bottom so we created the business with core cleaning practices which included washing surfaces as opposed to merely cleaning. We were fast, efficient and we were good. Still are! Eventually it got to the point where we needed to hire a person and then another and another and on and on it went. Now here we are 15 years later and still going strong! We still work our butts off but I work more on advertising and accounting. My wife runs all the crews. You can still get somebody on the phone at almost any hour. And we will still squeeze in jobs last minute. We still have our core cleaning philosophy and our company is basically an extended family with many of her relatives from Nicaragua on cleaning crews.We feel as though our customers are our friends and extended family too. Yeah that may all sound corny. But hey, I don't care. 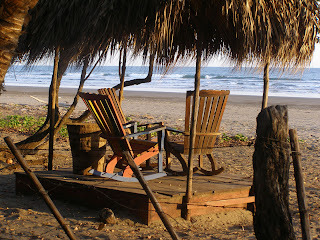 We still try to get back to Nicaragua every year or so to decompress and regain our sanity. My dream would be to spend 3 months down south each year. I have found a renewed love for the U.S. and San Diego in particular. There really is no place like home! My Peace Corps buddies working hard! About 2 years ago we decided to open a small little Thrift Store called, appropriately enough, A Perfect Find in a little strip mall across the street from our office. We use a portion of the profits to send money down to Nicaragua to help out children and projects that help the people of Nicaragua. Full circle! So when people ask why I started A Perfect Shine you can now see why I may have been reluctant to give a brief answer or share my story in the past. 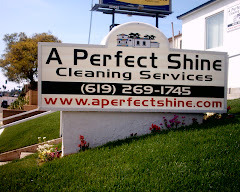 A Perfect Shine is more than just a business. It is a family. It is a philosophy. A Perfect Shine is an ever evolving ideology. To this day, I have yet to put on the monkey suit over these past 15 years. I am still on my quest for higher meaning. I suppose we are all on that same quest. We are all on different paths that occasionally intersect. Hopefully when our paths do cross we are each able to take something positive away from each other. Hopefully that positivity leads us one step closer to our ultimate destination. . .